Get the Bingo Bytes app download for your mobile or tablet by first signing up at bingobytes.co.uk in order to secure the £15 free welcome bonus. See how to install Bingo Bytes on your device below. Plus, we've got review nformation about this popular mobile bingo app. Bingo Bytes is a partner of the Live Bingo Network (which includes Play2Win Bingo, New Look Bingo & Landmark Bingo), and it's powered by software from Cozy Games. Weird inhabitants of the game - bingo balls that have mouths - put the byte into the mobile-ready site's theme. As mentioned earlier, you can get a free £15 (yep, no deposit) bonus upon joining. Then you can decide to either accept the first three deposit bonuses or take the cash option. With 90 ball, 80 ball, 75 ball, 30 ball and a Free Bingo room on offer there is plenty to choose from. 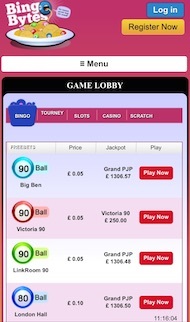 ​In the Game Lobby you will also find quite a few slots, a standard feature for most bingo games these days. You won’t find any Bingo Bytes Android downloads on Google Play due to restrictions nor Bingo Bytes APK files available to download. It also works on the new iPad as well as iPad, iPad 2, iPad 3, iPad 4, iPad Mini, iPad Air & Air 2.